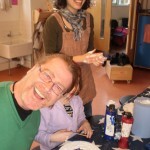 Dave has been KTCF’s graphic designer, volunteer youth worker and vegetarian cook since 2005. He describes the friendly, chaotic and supportive community at the Farm and his experiences going camping with 48 teens. As a long time Kentish Town resident, he offers his insight on the importance of the Farm programs for local children & teens.